Cardinal fans your football team is 5-1 in their inaugural season in the ACC and have now handed three teams in the ACC a loss in their opener. Syracuse become the latest team to fall to the Cards during the conference opener. It wasn’t always pretty but our Cardinals rolled up their sleeves and got the working man’s win beating the Orange 28-6. With the win the Cardinals now take the lead in this series 7-6 and maintain their spot at #2 in the Atlantic division. It is very apparent after watching the game tonight that the offensive line still has a long way to go. They had some moments where they looked like they had made some improvement but as far as the execution and the consistency that Coach Petrino wanted to see this week that really didn’t happen. The offensive line was responsible for 3 false starts for 15 yards, 2 offensive holding penalties for 20 yards, 1 clipping penalty for 15 yards. The offense was responsible for 1 delay of game for 5 yards, and 1 illegal formation for 5 yards. So yes these guys lacked some execution tonight. Enough with the negatives about tonight as the offense did have a lot of positive moments. The biggest story of the night was how Brandon Radcliff continues to be so effective. He becomes the first running back to have consecutive hundred yard games since Senorise Perry and romped for 110 yards with two touchdowns. It really looks like he is going to be the featured back moving forward. His footwork and ability to get that extra yard is phenomenal. He is a guy that runs downhill and can always find a hole even if it looks like he’ll be stuffed. Can’t wait to see what this kid has for them for the rest of the year. I really feel like we watched Reggie Bonnafon grow up a lot tonight. At times he showed a lot of poise as the pocket collapsed around him and he found a way to make the play. His second career touchdown pass was as good as it gets. He threw for 174 yards and one touchdown escaping at least three would be sacks. He only threw one interception and had a very efficient night. I don’t know if he will remain the starter once Will Gardner gets healthy, but he certainly has give Coach Petrino something to ponder. I really like what I seen from James Quick tonight as well. He was one of the guys that I had said in my pre-game that needed to have a good game and he did. His numbers weren’t huge but he had some clutch catches. It is going to help Quick greatly when DeVante returns. I tell ya folks the foundation is here for this to be a great offense and there is a lot of talent here. Lord help the ACC if our offensive line figures things out. I know I say this after every game in these online ramblings but I love our defense. This group came into tonight not allowing a touchdown in 11 quarters of football and left Syracuse tonight not allowing one. They have now played 15 quarters of football without allowing a touchdown and are only allowing 12.67 points a game. They held the Orange to 255 total yards and that #1 rushing defense in the country held a very good run offense to just 59 yards. This group will really move up in most of the national defense categories after tonight. The guys who really stood out tonight on defense was James Sample who had an interception, and Gerod “Superman” Holliman who had added to his national lead that now stands at 7 interceptions. Keith Kelsey led with 9 tackles on the night. These three guys were flying all over the field and making big play after big play tonight. Coach Grantham take a bow sir… You got one of the best defenses in the country and it just might be the best when the dust settles this season. And I have to give a shout out to our punter Ryan Johnson who really helped the Cardinals win the field position battle tonight especially in the first half. 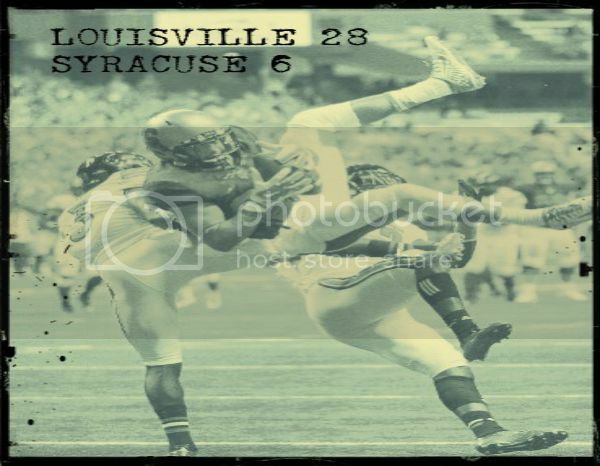 Cuse was only able to start one drive in Louisville territory in that first half. They started the rest of their drives on their side of the field. They started on the 49, 20, 16, 15 and Ryan also pinned them at the 1 and 9. Their average start in the first half was at their own 18 yard line and their average starting field position in the second half was their own 19. Ryan’s punting was a big reason why. It really helped us in that first half as our offense was sputtering. John Wallace also did a great job including some big kicks with one for 51 yards. This is a part of college football that is very important and these guys really stepped up tonight. Next weekend things get really serious as the Cardinals take their very first trip to “Death valley”. That is not a very friendly place to visit and that nickname was earned. I really think that our guys can go in and give Clemson a good game. With the way our defense is playing we have a shot to win against any team in the country. Devante Parker might soon make an appearance and I really feel like that will be the boost our offense needs. If it catches up we are gonna be really good down the stretch. 5-1 folks…. Enjoy this win! Enter your email address to subscribe to The Cardinal's Beak and receive notifications of new posts by email.